In early September, CBC radio’s All in a Day invited listeners to apply to be contestants in a Scavenger Stylist challenge. Spending as little money as possible, contestants were to spend a month decorating a room in their own home, with challenges thrown in along the way. Reality radio. My fiancée, Heather, applied and was one of four people accepted. She was paired up with another contestant, so there were two teams. Instead of decorating a room in one of their own homes, Heather and her teammate discussed their passion for helping others. 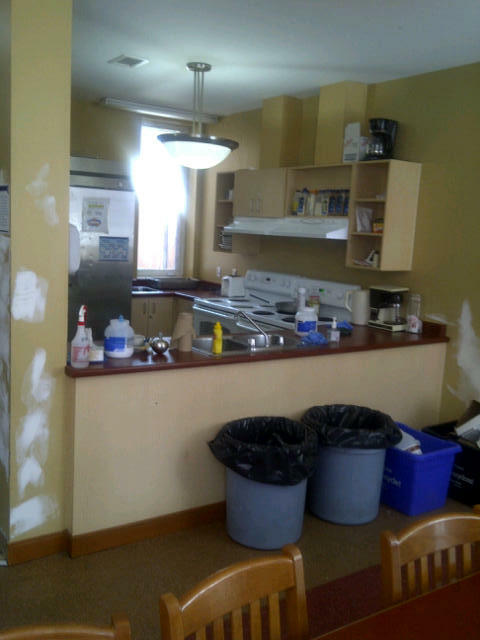 Over the September long weekend they reached out to various local charities and decided on the Youth Services Bureau of Ottawa Young Men’s Shelter after a tour given by worker Greg Ross. I came along. This program offers young men aged 12 to 20 immediate access to safe housing. 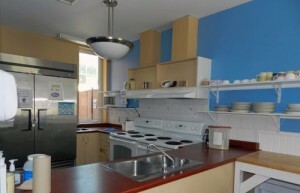 Open 365 days a year, the Young Men’s Shelter is always ready to welcome youth with nowhere else to turn. But the shelter is much more than a place to stay. Support is also available 24 hours a day. 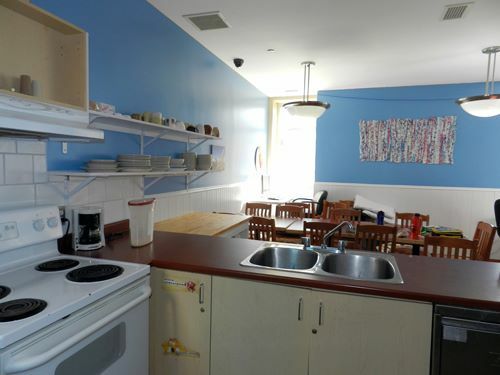 The shelter has 30 beds and offers both emergency shelter and transitional housing for up to a year. We could see the sunny kitchen and dining room, which serves 16 teenage boys each day, needed some help. While only five years old, you can imagine a space used daily by 16 young men would endure some wear and tear. I was moved by Greg’s dedication and passion to help the boys and offered to help. 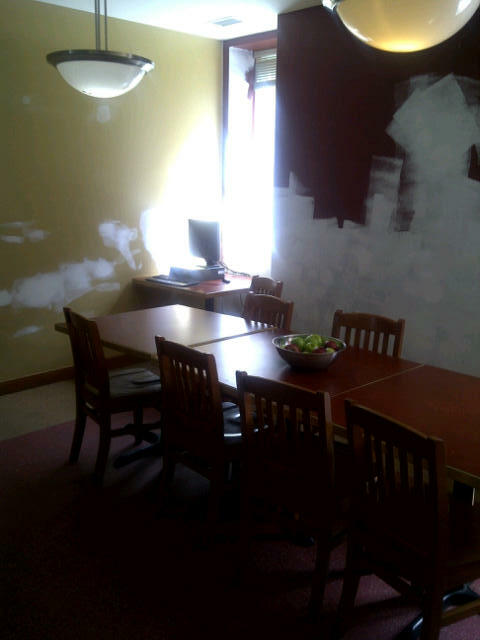 During the month, and thanks to the generosity of local organizations, we transformed the space. AFTER. The young men chose C2 paint colour “Sanctuary”. Paint: donated by Randall’s as one of the weekly challenge prizes. Backsplash tiles: donated by local designer Joanne McNally. She and her enthusiastic family spent a Sunday afternoon installing the tiles and painting. Wainscoting: I installed 50-feet along the base of the dining room walls to protect them from chair damage and keep maintenance down. Donated by Joanne McNally. Custom butcher block table: speaking with the staff and young men, the kitchen’s traffic flow wasn’t ideal. A hot dinner is delivered each evening and some men choose to cook their own food. They needed a serving area away from the stove where plates would also be accessible. 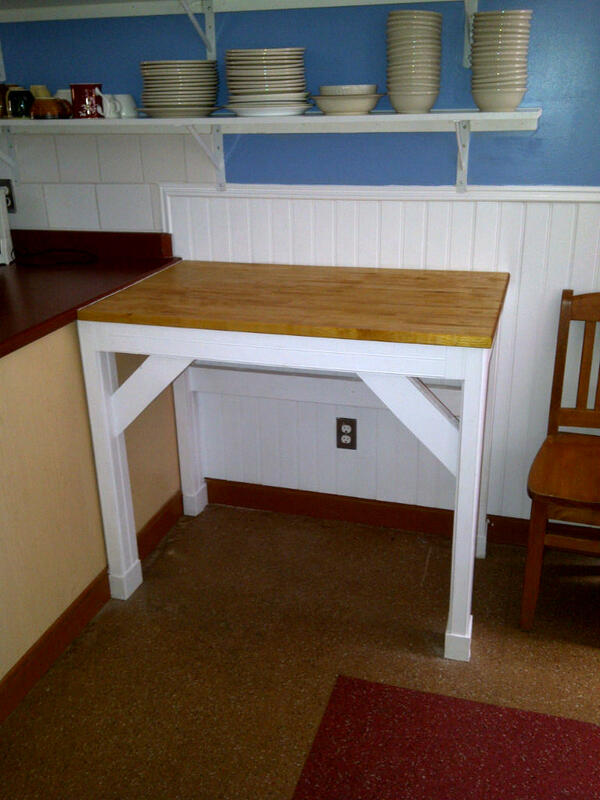 Using a butcher block donated by a past client and left-over materials from various projects, I built a custom serving area. Open shelving: Heather and I installed in the kitchen to replace water damaged cupboards and increase their storage space. Art: local organizations and artists donated the finishing touches. 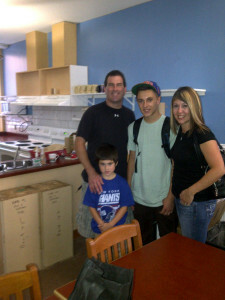 The other team helped a man and his son, new to Canada and supported by the Ottawa Mission. Together, Ron and Suzanne furnished his entire apartment, including providing toys for his young son. Read more about the challenge on CBC’s All in a Day webpage and on the YSB’s webpage. Alan Neal shot this video.